The Board of Mesa County Commissioners presents the National Health Center proclamation to MarillacHealth Development Specialist Martha Graf (left) and Community Relations & Development Director Kristy Schmidt (center) in public hearing. The Mesa County Commissioners this morning proclaimed Aug. 12-18, 2018, as National Health Center Week in the Grand Valley. The commissioners wrote: "Health Centers are a critical element of the health system, serving both rural and urban populations, and often providing the only accessible and dependable source of primary care in their communities." 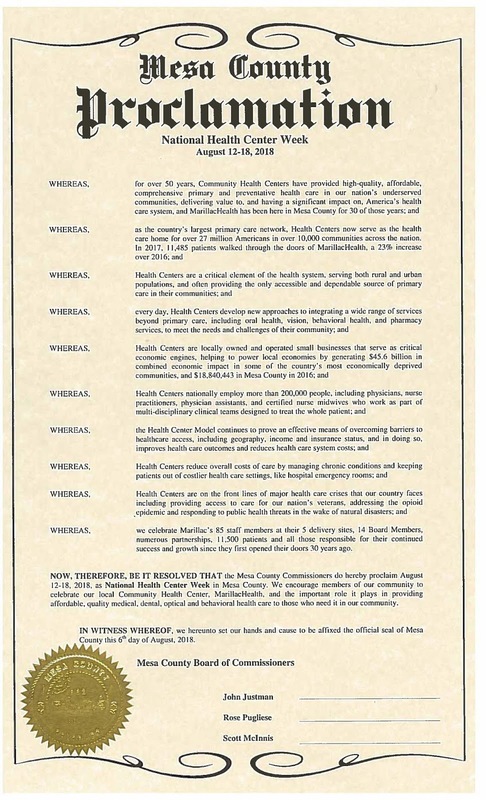 National Health Center Week is Aug. 12-18 in Mesa County.